Nice to meet you! My name is Cathy Kotarba. I am seeking a pet sitting professional job in Webster, Massachusetts,( and surrounding towns). I'm aiming to utilize my experience as a pet sitting professional. Available now. I am comfortable doing dog feeding ,Dog Walking, taking your pets to appointments such as the vet, or grooming. 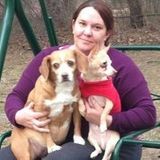 I am also comfortable with administering medications of all types, and have experience with giving animals insulin shots, and most basic medical care. I am comfortable with bathing/brushing dogs or cats as well. I have personal transportation available. Regarding my history, I have cared for animals of all types. I am a life long pet owner of dogs, cats, and fish. I am a strong advocate for the adoption of animals. I currently own three dogs and a cat, and all four were rescued and adopted. I volunteer with animals as well, at places such as Dog Orphans in Douglas, Ma. I love every animal as if they were my own. I understand as a fellow pet owner the great need to have someone you can trust and rely upon to give your animals the care and affection they need on the occasions when you are not able to be present yourself. If you have animals that suffer from separation anxiety, or you just don't like them to be alone for too long, then I am more than happy to stay overnight/ extended periods with your pet as well.You can feel confident that your pets will be in loving hands! I am First Aid/CPR, and MAP certified. I am passionate about all animals.